Its been over 6 months now that 3G services have been launched in India. Most Metros and “A” cities already have 3G coverage. Telecom Operators are rolling out 3G services in smaller cities as well. I have personally used 3G on different Telecom Operators here in Pune, and honestly, none of them could offer satisfactory services. One problem which I faced across all was that once the 3G is activated, voice call quality takes a big dip. In fact, many times voice coverage goes off completely – one cannot even make calls properly. And, it is not only me, but many people I have spoken to are facing same problems. Even 3G speeds are very erratic! 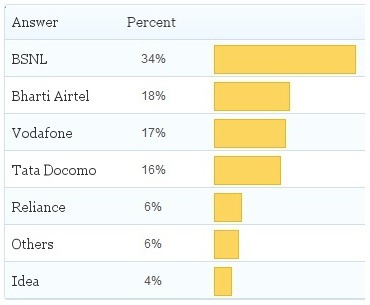 Question: Which Telecom provider offers best 3G services in India? BSNL has offered 3G services for quite sometime now – and they have the highest number of 3G users and hence it may have had slight effect on overall numbers. However, compared to other providers, BSNL does seem to offer better 3G services (in my experience as well ) and the top ranking seems justified. Bharti (18%), Vodafone (17%) & Tata Docomo (16%) are at similar levels – but they still have to go a long way till they start offering satisfactory services. Idea probably has least of 3G users which may have put them at the bottom of the table. While creating the poll, I had purposely not mentioned option of “none”, as I was sure most of the users would have opted for that and we could not have proper sense of providers offering better 3G services. If you have not voted as yet, please go ahead and vote! "Who provides the Best 3G services in India? ", 5 out of 5 based on 1 ratings. I have been using Airtel for more than 2 years, can say not usefull for official use. Connection drops and dose not connect till more that 30 min so useless to be dependent on Airtel. When made complaint to customer care they just do the time pass, mentioning complaint will be solved in next 7 days and we cant give call directly to the technical consultant directly. Also it is not even 2G in the other network where it claims to be 3G in roaming. Vodafone 3G services are limited to few states rather cities. Service is good where 3G is available. Use a post paid. In other states where they claim to have intra circle roaming arrangement with their partners, it is suggested to manually select the roaming partner. But I visited Karnataka (Bangalore) and Ranchi (Jharkhand), but I could not select the roaming 3G partner which is AIRTEL. So all the claims are false claims by the telecom companies. One can only learn through experience. Bsnl #g is more powerful and availibility of coverage than other co.
BSNL 3g IS POOREST OF ALL , WITH ITS DOWNLOAD SPEED OF 25 KBPS AND UPLOAD SPEED OF 12 KBPS. BSNL 3g IS POOREST OF ALL , WITH ITS DOWNLOAD SPEED OF 25KBPS AND UPLOAD SPEED OF 12KBPS. how much would bsnl 3g device costs need info. Launch the Reliance 3g in all other circle where 3g not launch from Reliance g.
BSNL did not stretch it’s 3G network after it’s first launch in 2011. The first 3G provider in India is BSNL but poor coverage by holding PAN India 3G permit. can someone comment their latest 2013 year experience with data cards. please tell speedtest.net results or data download speed, not what is advertized.by the company. Currently i am using vodafone 3G service. I am getting some where near 2MBPS speed when i am getting 3g service. Unfortunately here there is network issue. Hence most of the time it is in 2G network only. Are you using Vodafone 3G in postpaid or prepaid. – It would be heartening to know if one can get this kind of service in prepaid. By the way Reliance seems to be coming out with 4G – any idea about that. any body used airtel 4g available only in 3 cities though. they say 4G has may 100 mbps ???? there is a whole lott difference between ‘b’ and ‘B’ !!!!! NOw tell what u see when u use your 3G?? Hey Guys. I was downloading an app “Temple Run” in my mobile phone having BSNL 3G connection. The application’s size was 24 mb. AND IT TOOK ME NEARLY THREE HOURS TO DOWNLOAD IT. NOW THINK YOURSELF. Hey guys i am an airtel user, just dont think i am supporting them. But the truth is i got 3.5Mbps download speed in my 3g data card and upload was about 1Mbps. by calculation it will be half a minute – but what i really need to know does it sustain such a rate. I seriously doubt that. A genuine reply would be enlightning. vodafone 3 G is much faster than its rivals with the down load speed of 900 kbps and upload speed of 200 kbs. I will totally avoid Vodafone for my 3G.Holding a 3G USB Stick.So bad of service.Recharge of ten times rejected by co. and not willing to solve.Post sales is very very bad. Srinivasan Coimbatore Tamil Nadu. I am using Vodafone 3G … Very Good speed as mentioned…. I am agree with you all, BSNL is the best. In ranchi i have used airtel, vodafone, reliance and BSNL 3G, I use 3g for data service only. Airtel gave me the worst service, its average downloading spee is 100kbps and hardly reach the 200kbps, sometines it give 2g speed. Vodafone and reliance are same. BSNL’s perfomance is the best, it gives average speed of 400kbps and maximum speed i’ve got is 1.9 mbps. May be the reason for good service by BSNL may be due to the fact that when BSNL started they did that with land cable route which gives good consistancy. The other private operators took the tower route which may be quick to install but due to many facts like weather etc the service may be unsatisfactory. Also BSNL infrastructure may have already depreciated the cost so it is able to offer services at lower rates while others are slugging it out based on volume biusiness models. In becoming disperate for more volumes they are diluting the available frequency to more people.